As one of the most successful folk duos of all time, Simon and Garfunkel wrote and sang some of the most memorable and influential songs of the late sixties and early seventies. With their soft and distinctive vocal harmonies, I had reservations about just how similar a pair of actors could sound to Paul and Art, but the way the voices of Sam O’Hanlon (Paul Simon) and Charles Blyth (Art Garfunkel) blended together in The Simon & Garfunkel Story was hauntingly similar to those they were portraying. It is clear that this show is not about what they look like, but how they sound. Playing a short run at the Vaudeville Theatre before a one-off performance at the Lyric in December where it first showed to a London audience, The Simon & Garfunkel Story isn’t like most juke box musicals. The story of the pair is told by O’Hanlon and Blyth themselves, who do not pretend to remain in character once the music stops, even if the polo necks and bouffant hair tell another story. 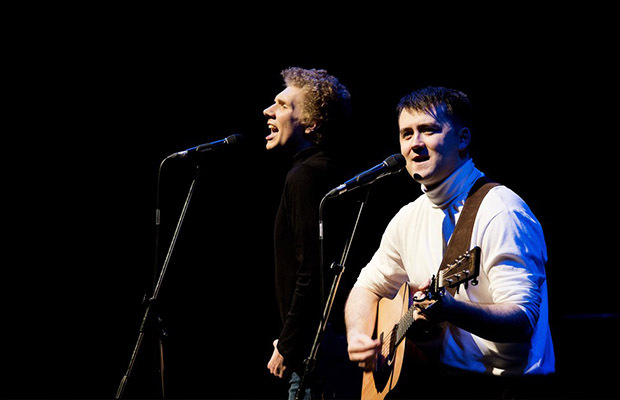 Speaking in their own English accents, a far cry from the New York lilts of Simon and Garfunkel themselves, and slightly off-putting, the two main actors tell us the tale of the duo between songs, breaking character before harmonising beautifully once again. As they dipped in and out of character, it felt more like a cringey tribute act at times, especially as the audience was often encouraged to clap along awkwardly. But with the mannerisms and stunning vocals, plus impressive guitar picking from O’Hanlon, any cheesiness vanished as soon as they sang, and you might be forgiven for thinking that the actual Simon and Garfunkel were on stage if you shut your eyes to listen to the stunning sounds of “The Boxer”, “Scarborough Fair” and “Mrs. Robinson”. This show is as close as you can get to the real thing at the height of their success. Along with narration from the actors, The Simon & Garfunkel Story features a large video screen behind the stage displaying newsreels, adverts and other footage from the 1960s and 1970s, providing a nostalgia trip for much of the audience. The screen also gives extra information about the duo’s careers after they disbanded and then later reunited, plus their solo successes. The production might have been more effective if the story was elaborated to be told in more detail as is done in Sunny Afternoon and Tina, but its simplicity emulates the music itself as the audience is captivated by two men on stage with one guitar (albeit with a full band for some numbers), in simple outfits with impeccable harmonisation. Beginning with the evocative “The Sound of Silence”, with the moving “Bridge Over Troubled Water” being performed towards the end, The Simon & Garfunkel Story must be seen by anyone who is a fan of Paul and Art’s music, and you might just come out feeling as though you’ve been listening to the real thing.